Rosy Outlook: Fall Looks from Last Year to Recreate + FF Link-Up! Fall Looks from Last Year to Recreate + FF Link-Up! This was from J. Crew Factory last year--if it comes back in stock this season I'll let y'all know because you NEED it! Happy Wednesday loves! First off, sorry that I missed my Monday post. We only had time to do one outfit shoot on Saturday before it rained and of course I hated how it turned out! Sunday we spent pretty much the whole day at the winery with friends so still had no time to get in an outfit shoot. The last few months pretty much since the wedding have been so crazy busy so I'm glad for the rest of this month and most of September it will be more laidback so I can focus on my blog content! Anyway, since we weren't able to get in an outfit shoot, I thought it would be fun to share some of my favorite fall looks from last year because a lot of items are in stock again this year or there are plenty of similar options! I don't know about y'all but the minute August rolls around, I am just READY to break out the fall wardrobe and for the temperatures to drop just a tiny bit! All of these are so fabulous! I love the wine colored shirt dress on you. I am also drooling over all of your booties! Fall fashion is by far my favorite! I love all of these looks and now I can't wait to break out my booties! This reminded me of how truly wonderful your style is! I am so excited for fall fashion and all things pumpkin! You put together the cutest looks for fall. I'm so excited for it to finally be fall time so we can wear cozy outfits. So many great fall looks! I think my favorite was the last one with the burgundy hat. I'm so ready for the fall temperatures! Happy Wednesday! Not me! I live in Wisconsin. Summer barely just got here. I'm not ready for it to end yet. Love your looks though! Your fall looks are so chic and super cute, loving them and cannot wait to see what you wear this coming fall! This is making me so excited for fall! That flared jeans outfit is amazing! Bring on the cool weather! So many fabulous looks from last season and still so relevant! Love your style- makes me excited for fall! Your style is so similar to mine! So many gorgeous outfits! Absolutely love the purple dress. this makes me super excited for fall time! great looks! Yessss- all these looks are definitely going to be super hot again this fall! Love, lady! All the fall feels! I am SO ready! This makes me crave Fall! I love that any of these looks still works this year! Beautiful outfits! 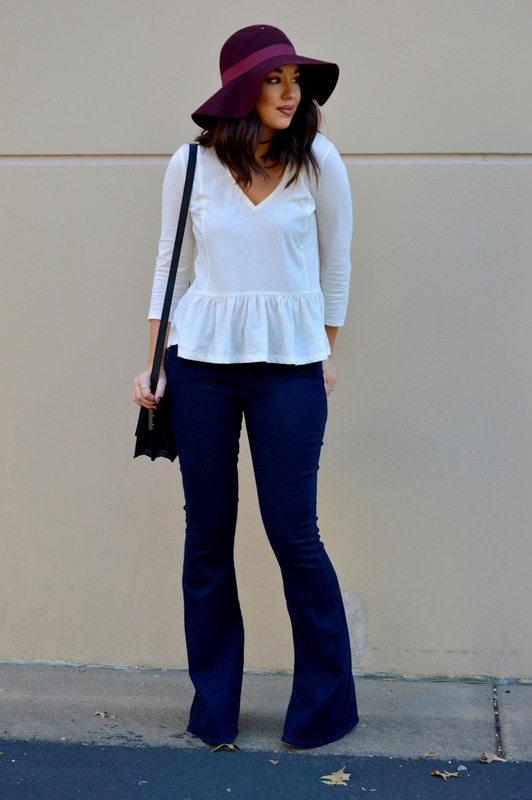 My fav would be the last one, I like the blue denim flare pants and the effect of white ruffled hem top. Really good contrast of color. Cute hat as well. I love all of these looks! The cardigan in the first photo and the camel coat are my favourites! I've been trying not to think about summer coming to an end but I think I'm almost ready to embrace fall styles now.